Outside of quarterbacks and left tackles, perennial edge pass rushers have become premium assets in the NFL. Former Arkansas defensive end Trey Flowers found his niche in the big leagues doing exactly that. Paired with another former Razorback, Flowers has made a name for himself on the New England Patriots defensive line. Selected by Belichick’s Patriots with the 101st overall pick in the fourth round of the 2015 NFL Draft, Flowers signed a four-year, $2.8 million deal. Despite recording a sack on the Packers’ Aaron Rodgers in his very first preseason game, he missed all but one game of his rookie season after being placed on injured reserve in December 2015. Flowers came back better than ever, breaking out in his second year. He logged 45 total tackles, seven sacks and a pass deflection in eight starts and 16 appearances. Flowers’ biggest performance of the season came in the grandest of moments as the 6-2, 265-pound defender racked up 2.5 sacks in the Patriots Super Bowl LI victory over the Atlanta Falcons. He followed up his impressive campaign by playing just as well in his third year. Flowers increased his tackle total to 62, including 6.5 sacks, three pass deflections and two forced fumbles in 14 starts. He tied for the most quarterback hits among all edge pass rushers in 2017 and ranked 14th among 4-3 defensive ends in pass-rush productivity. As a member of Columbia High School in Hunstville (Ala.), Flowers earned all-state nods in both his junior and season seasons. An unheralded stud, 247Sports rated Flowers as a three-star prospect and the No. 42 player in the state of Alabama. Receiving offers from only the likes of UAB, Georgia Tech and South Alabama, Flowers went with his biggest opportunity, playing for the Arkansas Razorbacks in the SEC. Named to the SEC All-Freshman team, Flowers contributed 28 tackles, 5.5 tackles for loss and a sack in 13 appearances. Starting all 12 contests as a sophomore, he racked up 50 tackles, 13 tackles for loss and six sacks, including 3.5 quarterback takedowns against Auburn, earning him SEC Defensive Lineman of the Week. Flowers improved to second team All-SEC as a junior in 2013, putting up 44 tackles, 13.5 tackles for loss and five sacks. Deciding to return for his senior season, Flowers was named second team All-SEC again by the league’s coaches for his 68 tackles, 15.5 tackles for loss and six sacks. He ended his college career with five tackles and a sack in a blowout Texas Bowl win over the Longhorns. Flowers completed his Arkansas career as the SEC’s active leader and tied for second in the country in tackles for loss with 47.5. He also finished ninth in Razorback history in sacks with 18. At the 2015 NFL Combine, Flowers was a top performer in the vertical and broad jumps, measuring at 36.5 inches and 10 feet-1 inch, respectively. Though he didn’t increase his draft stuck much by returning for his senior year, Flowers ended up in a perfect situation in Foxboro (Mass.). Heading into this season, Flowers remains the go-to guy at right defensive end and is backed up by Derek Rivers. Former Arkansas defensive lineman Deatrich Wise sits at second team left defensive end behind Adrian Clayborn. If Flowers makes the same jump in year four that he saw in his second and third seasons, he could be looking at an All-Pro type of showing. 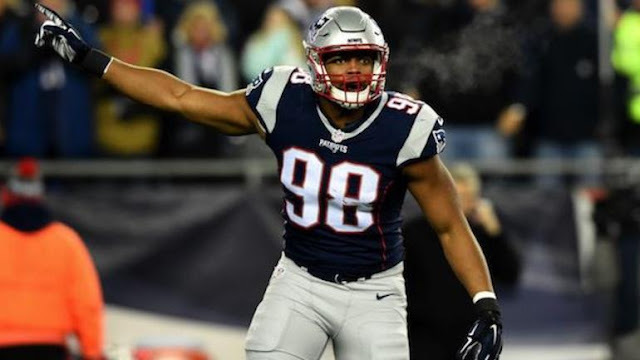 With the value of defensive ends constantly increasing in the modern era, Trey Flowers should have a role in the NFL for a long, long time.